But what I do love about the classic 900 is the Ergonomics. Sitting on one of those fits my body so much better than a newer generation Monster. Since it was so skinny, I almost flat foot the old 900. Twins are certainly easier to flat foot (if you want to). If the 821 fits anything like that, it might jump back in my top 10 bike list (sorry, currently living in my brain). Certainly the technical upgrades like ABS, Traction Control and a full Electronics Package makes it a nice update. Also the 100+hp makes it even better. Looks like we won't see it until 2018, and I'm guessing that cost won't be released until EICMA in a couple weeks on November 5th. 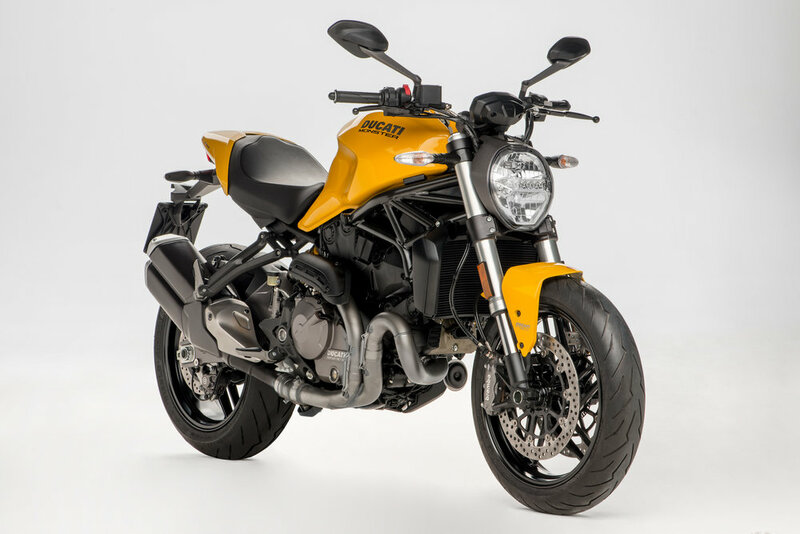 Ducati unveils its updated Monster 821: the most balanced version of the iconic Monster range. Borgo Panigale, Bologna (Italy), October 17, 2017 - Providing a sneak peek at 2018, Ducati presents the first of 5 new models for the coming season: the Monster 821. The iconic naked motorcycle from Borgo Panigale is offered in an updated version to celebrate the 25th anniversary of the original model - launched at the Cologne Show back in October 1992. The 821 inherits all the character and charm of the first Monster 900, the model that injected new life in the naked racers' segment - by successfully combining high performance, agility, and rider-friendliness. The Monster 821 changes its shape by adopting the design and functional features introduced in the Monster 1200: a sleek, streamlined design with completely redesigned tank and tail end, inspired by the 1992 version. A new racing silencer and headlight - both classic and contemporary, are also part of the new design. For a clear, immediately readable view of all necessary information, on the mid-size Monster, a color TFT display is also making its debut - provided with selected gear and fuel indicators. The Ducati Quick Shift up/down and the Ducati Multimedia Systems are now available as accessories, to further enhance the already excellent riding experience offered by the 821. 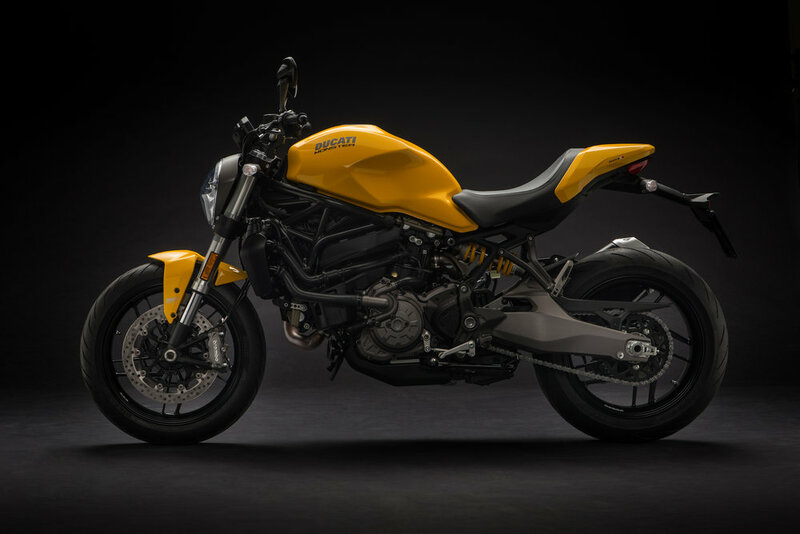 The Monster comes back in the historic Ducati Yellow color that charmed so many Monster fans in the past. This color, available for the 821 only, completes the Red and dynamic Matte Black color range. The 109 HP and 9250 rpm of the liquid-cooled twin cylinder Testastretta offer rider-friendly thrills; thanks to its 8.8 kgm (86 Nm) torque at 7750 rpm, the 821 guarantees exciting performance, comfortable riding and unmatched fun. The Monster 821 also features the Ducati Safety Pack, which comprises Bosch ABS and Ducati Traction Control, both of which have adjustable intervention levels. The Riding Modes ensures easy adjustment of ABS, DTC and Power Modes (controlling peak power and type of delivery), transforming the 821 into three different motorcycles, each with a distinct personality. Completing the impressive equipment on the Monster 821 are the Brembo brakes, with dual 320 mm discs and M4-32 monobloc radial calipers at the front. The suspension system includes 43 mm forks at the front and an adjustable shock absorber at the rear. The impressive standard equipment, extended maintenance intervals, and a rich catalog of accessories make the 821 a perfect riding partner. The new Monster 821 is just the first of the Ducati 2018 new range. The Ducati World Premiere, to be streamed live on Sunday, 5 November at 9 p.m., will unveil four more new models designed by the Italian manufacturers, which will later be presented to the general public at EICMA - scheduled from 9 to 12 November at the Rho fair. Ride Report, Bike Review and Pants! First off, I have to say that a Monster is a really really great motorcycle. And I can definitely see why many people love them so much, especially as first or second bikes. However, after having ridden many different bikes with really really great suspension, performance and handling it's very difficult for me rank this bike near the top of my favorites. I thought the height and weight were nice, certainly a lower ride than what I'm used to on my SV650 and the Speed Triple. However, after having ridden the (Triumph) Speed Triple, I can definitely say that I want a Triumph of my own. But the STreet Triple, the smaller and more compact version of the Speed. The main reason is the suspension! So this is where I'm coming from, having ridden an amazing bike with superior handling especially on the front end. I would definitely recommend a Monster to anyone moving up from 500-600cc or looking for a mid size twin over a mid size inline 4. I certainly enjoy my twin very much. But I'm tired of stock suspensions that aren't adjustable so saving up for a used Street Triple R is my current plan for next Spring. As far as the Monster, I would have to say it's a much better version of the SV with a little more power, ABS, nicer wheels and a few other bells and whistles. But for me it just doesn't compare to what a Triumph has to offer, so unless it had an upgraded suspension you don't find me looking for one anytime soon. However, what I would recommend is riding these two roads! I also wanted to mention the pants my friend Aleks and I are wearing. Unfortunately those exact models are discontinued (Rev'it Marryl and Gear Pants). However, the latest version is the Gear 2 pant, which I reviewed a couple seasons ago here. There's a reason why Rev'it is my favorite brand, and it's because they know how to put us in gear that fits and looks great! Happy Riding, and don't forget to Gear Up! PS, If you live in the Bay Area, you owe it to yourself to ride these roads, asap. You just have no idea how much I miss them. Someone picked up a new-to-him Speed Triple this week. I've yet to climb aboard but I'm sure that will end soon when we take a 4 day weekend trip to Williamsport, PA during the 4th of July. We'll be meeting up with a couple of very good friends to ride back and forth across the state and finally hit up some incredible twisties! Sitting on this bike, it's a bit taller than my SV, but nothing crazy.